The Sedona Excentric Task Force takes a look at bullying. For centuries, humans have been known to pick on the most vulnerable. Often, a crowd would gather to encourage the stronger person to tease, taunt and sometimes physically attack an inferior person often unable to defend themselves. Whether it was stealing someone’s lunch money or giving them a wedgy, it was meant to humiliate and hurt. Now, with social media, people are using computers and cell phones to harass, embarrass, and mentally scar others to make themselves seem more powerful. Once thought limited to humans, bullying now has been observed among others in the animal kingdom. 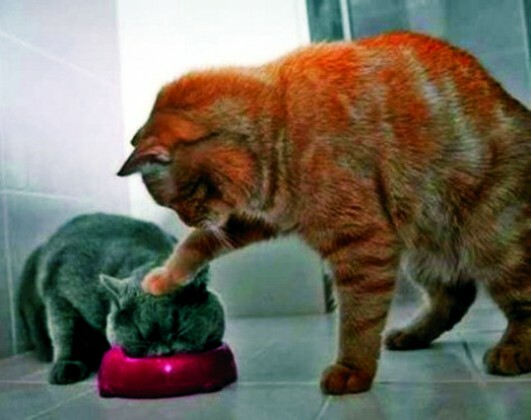 Pictured is an example of bullying among the feline family. Now, scientists will study animals to see if their behavior is innate or if they have developed traits from observing the actions of humans. Perhaps if such behavior in animals could be adjusted, there may be hope for disturbed people.